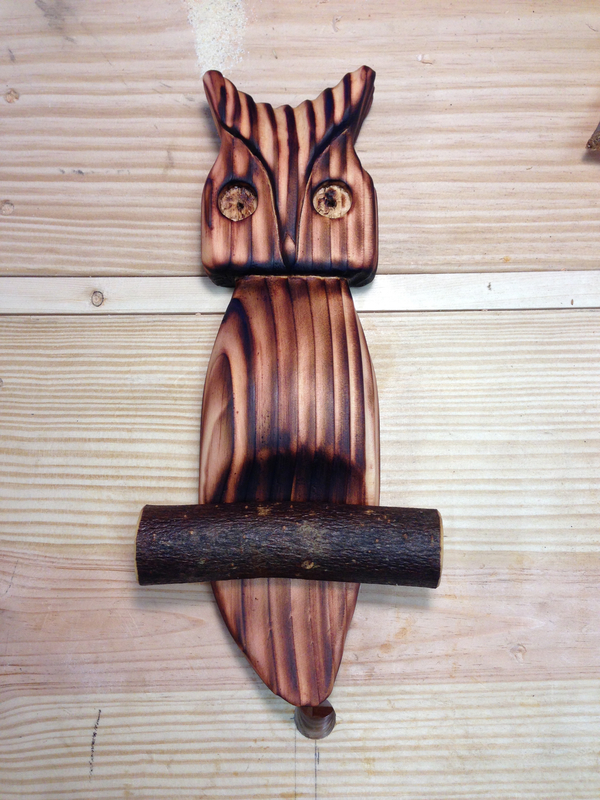 ← Coat Hooks and Art? While searching the internet for retro art ideas for our house, I came across a requiring theme. Owls. 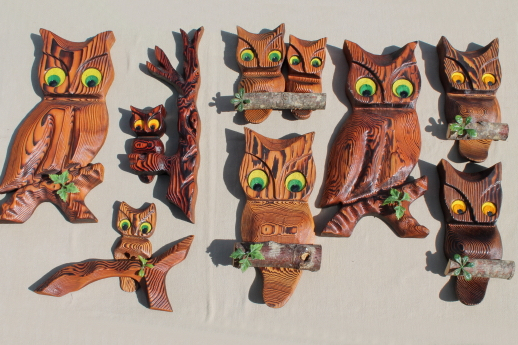 All of these owl stirred up vague childhood memories. 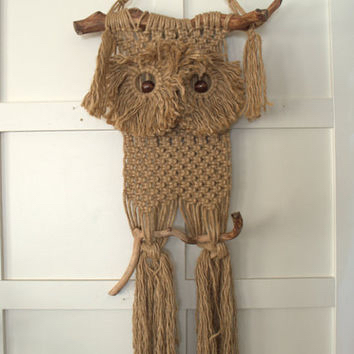 I seem to remember just about every house I went to as a child had some form of owl themed decoration. Waaaay too far back to be sure, but that is how I remember it. Most of these decorations were some version of macramé. Like this one. I don’t remember any specific wooden examples from by childhood, but these had a familiar feel to them. So I decided to spend an easy afternoon in the shop and see what I could come up with. 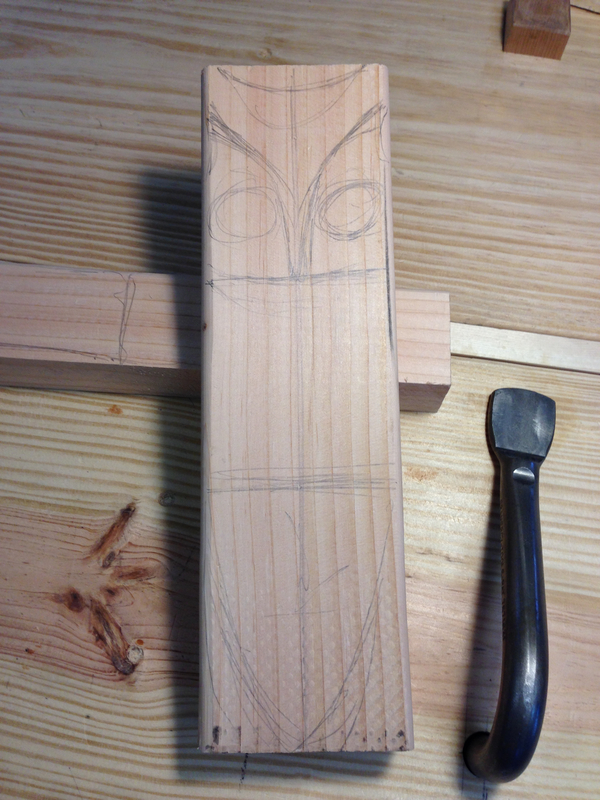 Starting with a scrap of 2×4 and a rough outline. 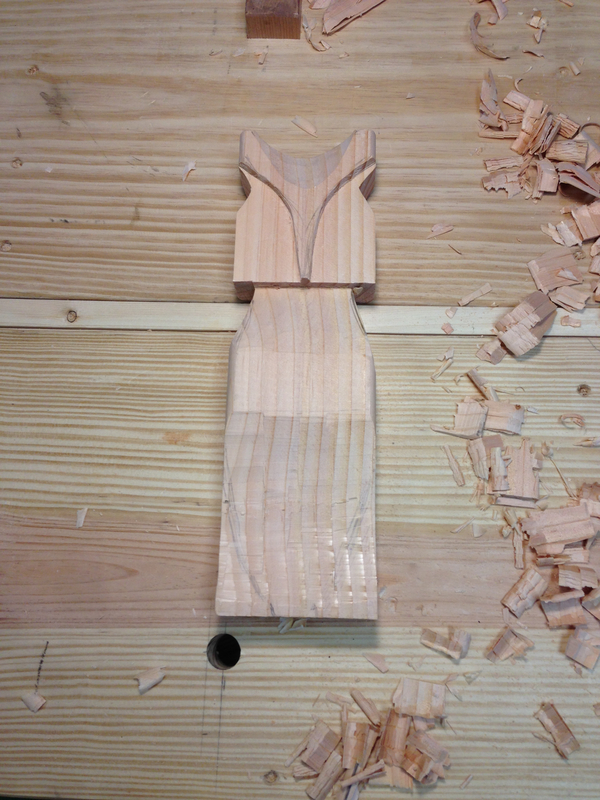 Saw cuts, chisel and gouge work. Nothing says “fun”, like a propane torch and burning wood. I think I may have had too much fun, but we will see. 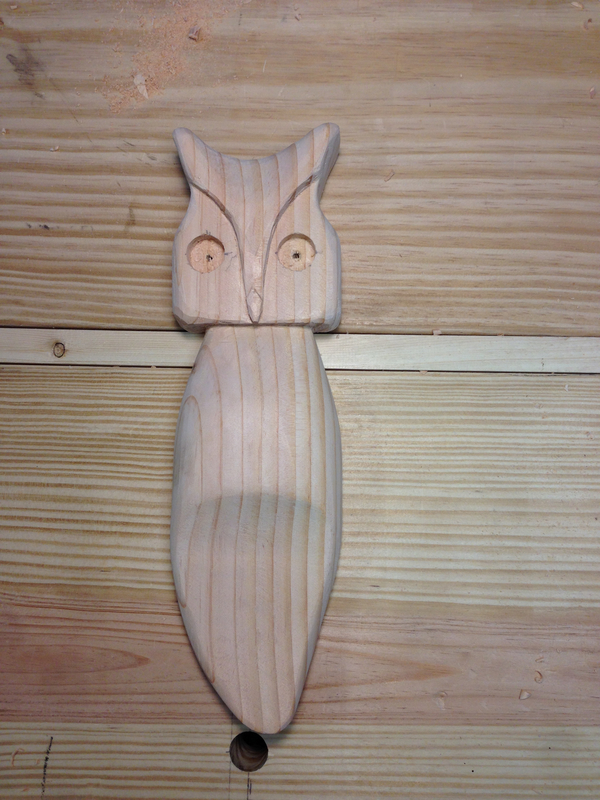 After a good hard brushing and a little sanding. Hey, this texture looks familiar…hmmm. 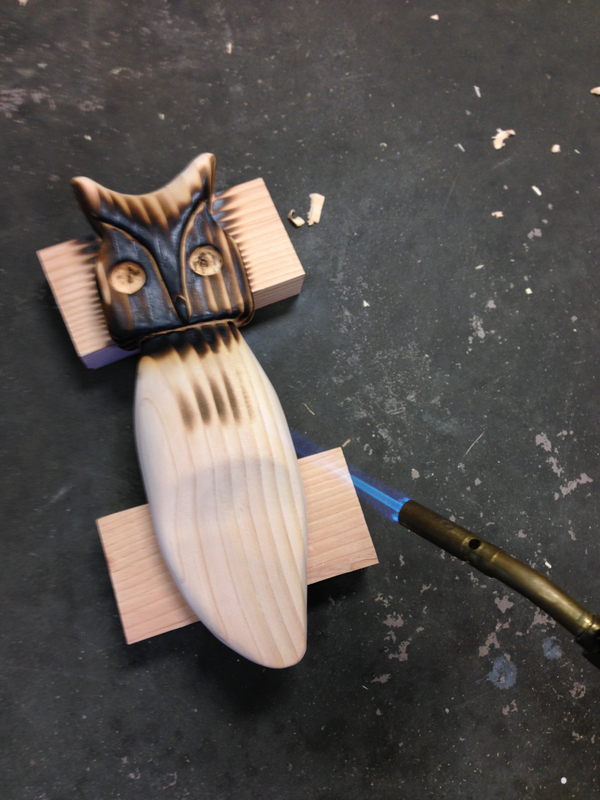 First coat of oil and a shot of the stick perch. I’ll put another coat of oil on tomorrow after work. Once that has dried, I’ll fashion some eyes from felt. Till then. 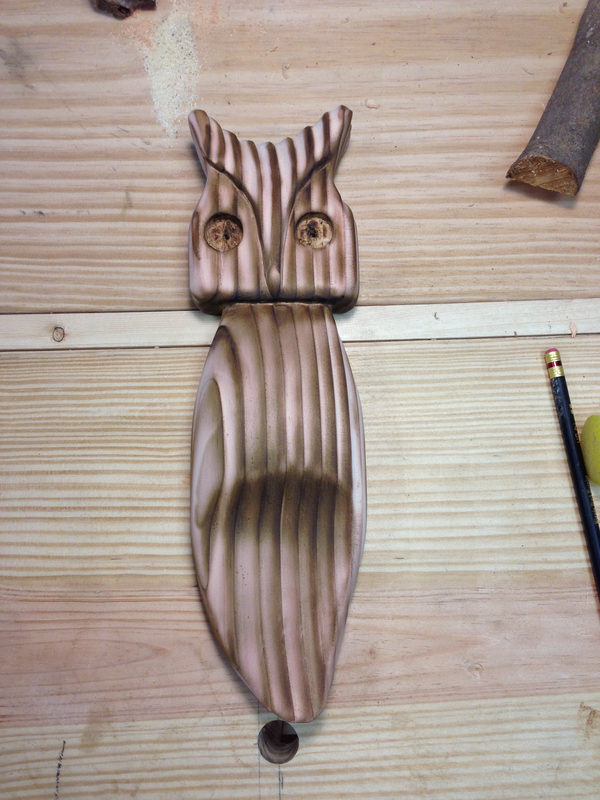 This entry was posted in Wooden Owl Wall Hanging and tagged carving, decorative. Bookmark the permalink. 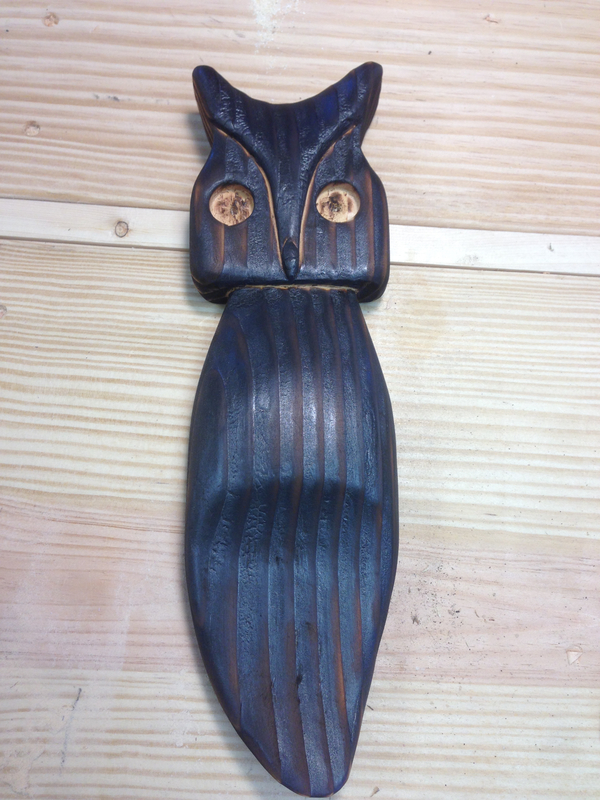 That is a good project to get into carving and is appealing as well, you could save yourself the brushing and use the age old Japanese approach of using the connoisseur polishing brush. They too score the timber and then brush off the remnants which leaves a beautifully evenly coloured timber. That’s their approach to tackle blotchiness and it’s permanent as well. It was a fun and relaxing way to spend an afternoon. I used a homemade version from an broom. I did not want to contaminate my proper uzukuri. Then I deliberately took off a little more with sandpaper. I wanted the drastic contrast in color. Nice one. My eight year old daughter would love this. She is obsessed with owls these days for some reason. Not to give my age away but this harkens “back to the day!” and must admit I’ve macramed an owl or two similar to yours. Also burned Redwood and Douglas fir for that effect in mantles, tables, etc. What’s the expression — everything old is new again? Very cool. I like the way the grain makes it look like his body is turned to the side a bit. Nice. You’ll love the polish you get from your Uzukuri.